The Samsung Galaxy S7 will be sold for Rs. 29,990 during the Flipkart Big Billion Days Sale, which is scheduled to start this week. This is not a joke, it’s the real deal. Now, this is an incredible offer indeed, especially considering that the phone currently retails for a massive Rs. 42,000 and upwards on Flipkart and around Rs. 39,000 on Amazon. So, how is Flipkart offering over 10,000 Rupees of the price remains to be seen. This could be an exchange offer, but it doesn’t seem to be as you can see from the poster. It clearly mentions that an extra Rs. 3,000 off can be availed for regular exchange of devices. There is no * on the picture, to hide hidden terms and conditions, neither does the sale’s sneak peek page. And it is possible that you could buy the Samsung Galaxy S7 for Rs. 27,000 (Rs. 26,991 to be precise) during the Flipkart Big Billions Days Sale, because Flipkart has been advertising an Instant Cashback Offer of 10% for State Bank Of India (SBI) Credit and Debit cards. We aren’t 100% certain whether this discount will be available for the S7, as the store has yet to declare the offer terms and conditions. It is unclear if the Samsung Galaxy S7 Edge will see a similar offer. The Big Billion Days sale starts on 20th September (Wednesday), and will run till 24th September (Sunday). The mobile part of the sale starts on 21st, i.e. Thursday. 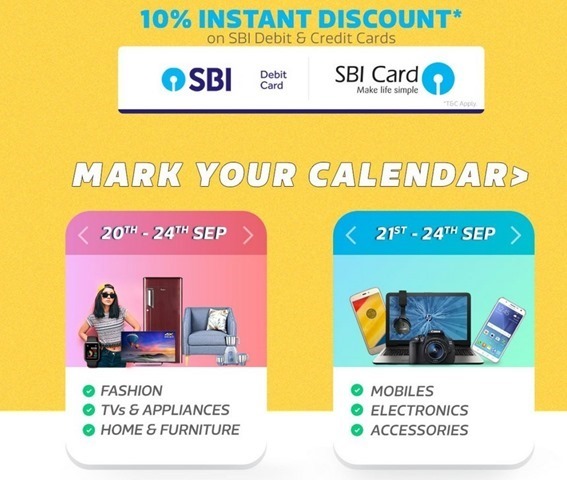 You can also get discounts for TVs, Appliances, Home and Furniture, Electronics, Accessories and Fashion stores during the sale at Flipkart.